Throughout the years, I have seen quite a few example of art by techie types that depicts the Smith Chart. After an extensive Internet search using multiple search engines, I was able to come up with these few. If you know of any other works (including your own), please send me the information and I will add them to this page. All copyrights are acknowledged here, but I need to use thumbnails of the images to get you to visit their websites. 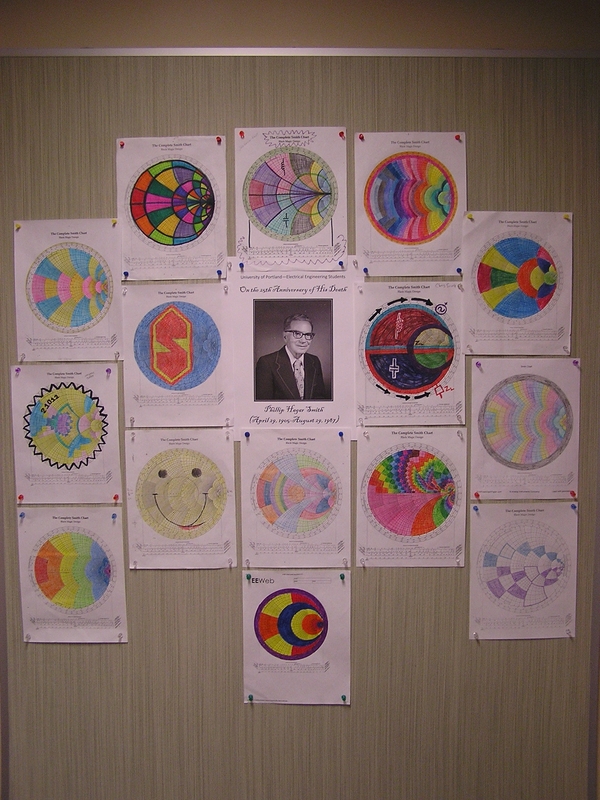 Prof. Aziz Inan of the U. of Portland had his students create some Smith Chart art on the August 29th, 25th anniversary of Phillip Smith's death. £2 coin from the British Royal Mint released in 2001 as a tribute to Guglielmo Marconi has a Smith Chart on the reverse side. This milled wood Smith Chart coaster was sent to me by website visitor Enrique R, of Norcross, GA.
Pamela Anderson would be wearing a T-shirt with a Smith Chart on it? Too bad it isn't an RF Cafe T-shirt! Smith Chart quilt, by Professor Cynthia Furse of the Department of Electrical and Computer Engineering at University of Utah (formerly at Utah State University). She has her students sign when they have finished their design projects. See Dr. Furse's video tutorial series on the Smith Chart. I have a huge list of resources on the Smith Chart here.